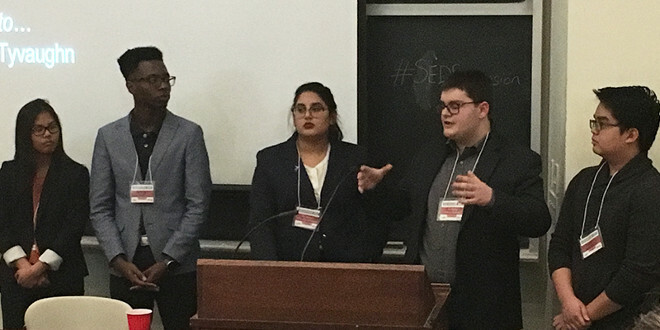 From McMaster University, the winning team for the Ascension conference’s annual Young Space Entrepreneurs Competition (YSPACE), shown here taking questions about their project, conceived as a company that will repair, upgrade, refuel and maintain satellites in space. From left to right; Venus Orig, Tyvaughn Holness, Hira Nadeem, Arvi Mulliqi, Julian Vincent Sedillo. ​Not shown: ​Harsh Bansa. Credit: Larry Hicock/SpaceQ. Hosted this year by the University of Toronto Aerospace Team (UTAT), the event is presented annually by SEDS Canada (Students for the Exploration and Development of Space). 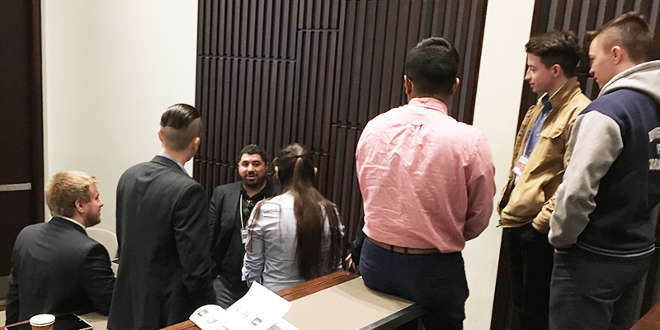 SEDS Canada chairman Elias Solorzano gives full marks to the conference team, directors and volunteers at the University of Toronto – and to the event’s 18 distinguished speakers – for making it such a great success. But are all of these students budding entrepreneurs? Eric Choi, Senior Business Development Manager at Magellan Aerospace, helped put it in perspective during one of the breaks: “When I was in school, it was about ‘How can I get a job?’ Today it’s ‘How can I make a job.’” That mindset speaks to the times we live in, and it applies to all kinds of industries and professions, whether you start a business or even if you work for one as big as Magellan. And when you put that notion into the context of space, it can quickly get the mind a-spinning. So it was this past Saturday morning. In less than two hours, attendees got a sweeping overview of how the business of space works in Canada. The New Space crowd was represented by two small firms, Kepler Communications and SkyWatch. Old Space was represented by Magellan, one of Canada’s most established aerospace companies. The audience also heard these business leaders’ thoughts on Canada’s space policy: issues, strengths and weaknesses, what could and should be done to help push the industry forward. SEDS student-members get to meet industry leaders like keynote speaker Grant Bonin, Chief Technology Officer at Silicon Valley-based Deep Space Industries. Credit: Larry Hicock/SpaceQ. (Left to right): Panelists Jeff Osbourne, Eric Choi and James Slifierz field questions from the audience following their talks on Space Business and Policy. Credit: Larry Hicock/SpaceQ. That crazy idea was actually a clear and compelling mission: “Our goal was to be the largest deliverer of intelligence from space. We wanted to be the number one source where people went to get intelligence from space.” The business challenge? Moving from servicing a “market” of a few dozen scientists to creating a sustainable, revenue-generating customer base. In the conventional business world, the logical next step would be to identify that market and the strategy for getting there by way of some serious and expensive market research. In today’s startup world, the end goal is the same, but not the means, or the dollars it takes, to get there. “Before we spent an ounce of time writing code on this project, on our website we said that we already had this built, and if you want access, let us know. We were trying to (a), determine and validate that there was demand, and (b), use that as a way to do real, hard, customer-driven research into trying to understand what the problem was. Within four months we had 1500 companies signed up, which was mind-blowing. Fifty percent of our traffic came in through organic search; twenty-five percent was referral, and the other twenty-five percent was from blogs writing about us. 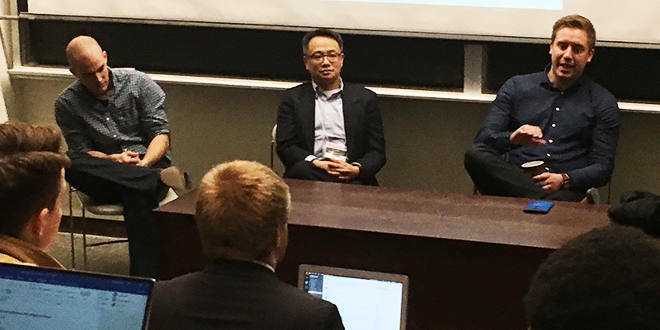 Eric Choi’s session focused largely on the policy side, however he did draw one parallel between Magellan and today’s startups – namely, the pioneering spirit that has long typified the Canadian space industry’s decades-long history. What are the advantages that in the aerospace sector in particular can be leveraged in future startups? Jeff Osbourne: “The talent base in Canada is unique in that there is a bigger supply of talent that is being underutilized. We have an incredible talent pool of people coming out of schools – and they all go to the States, or they go to companies they don’t necessarily enjoy working at, they go to companies that maybe don’t offer the kind of growth opportunities that you might have in the US or in certain places in Europe. If there’s one thing you would change about the regulatory environment, what would it be? Jeff: “Procuring government contracts as a Canadian company is quite difficult when you’re a small company. In the US, they have what is called the Small Business Administration, and they have interesting regulations where a certain number of contracts that the government gives out has to go to small, disadvantaged businesses; these are things like aboriginal businesses, women-owned businesses, small & medium enterprises, businesses in economically disadvantaged businesses. Canada doesn’t have this. Editor’s note: The story was updated on Monday, March 13 at 1:30 p.m EDT to reflect comments submitted by Eric Choi. Larry is an author, filmmaker and business/technology writer. He is the president and creative director at Sparketers, a small marketing agency in Toronto that specializes in B2B marketing communications and industrial video. His most recent initiative is a feature-length documentary that will be released this summer.